Real estate investments haven’t performed so well over the last couple years, as the bursting of the housing bubble really hurt the market and impacted many lives in a negative way. In fact, some people question whether real estate is the cash cow and successful market that it always promised to be. But if you look at the rates of return on real estate over the past several years, the picture becomes much stronger than just taking the market at face value. In fact, in 2012, 2013, and now looking ahead to 2014, the real estate market from an investor’s point of view may not get much stronger than it is right now. In 2010 and 2011 alone, the FTSE NAREIT Index, which measures real estate investments listed on NYSE, NASDAQ, and AMEX, returned more than 25 percent for the average investor! Understand, though, that the NAREIT Index primarily covers publicly traded companies which work in commercial properties, malls, office buildings, and more mass real estate and development. For the average investor, public REIT investments allow the little guy to play with the “big boys,” while still retaining liquidity and security. Options like this make commercial real estate investments – and investing in real estate in general – a viable option for many people. More than just public REITs, though, real estate is a decent investment on a small scale for any investor due to the bounce back of the housing market. Housing values are up, and have been consistently up for the last 12-18 months depending on your location across the country, though they still may not reach the double-digit levels of several years ago. Nevertheless, both residential and commercial real estate are starting to bounce back from recession, and builders across the country are beginning to take on new construction projects, while investors have injected millions of dollars of capital back into the market for future investment and business. It’s important to understand the economic backdrop while investing, but for the foreseeable future, the real estate market both residentially and commercially is on the rise. But the bottom line remains; the trend in real estate is your friend! Investors stand to make big money off their investments and assets if they approach it wisely and invest with the smarts and intelligence needed to see the pay-off in the long run. 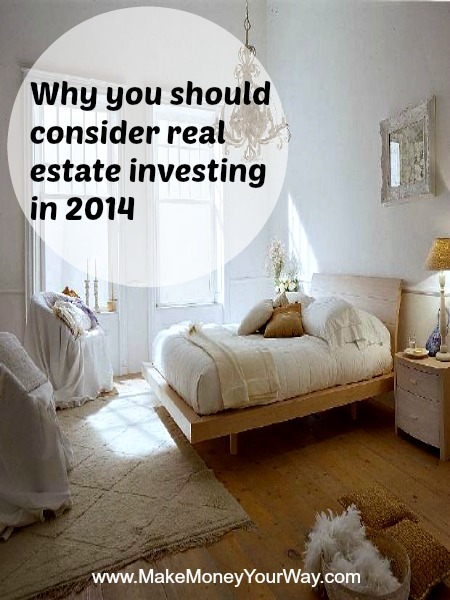 Consider investing in real estate as rates and returns climb. Do not count on 20-plus rates that had become commonplace over the last several years prior to the housing market bubble bursting, but understand that the overall economic backdrop is improving. Rents are increasing, prices are increasing, and home valuations are still below their historic levels. We may not be completely out of the woods yet as we still recover from the housing bubble that burst just a few short years ago, but as long as the economy continues to strengthen on the path it’s been heading, there is money to be made in the real estate market – whether commercial or residential – in 2014 and beyond. This post was featured on the Carnival of Financial Camaraderie, Carnival of Financial Planning, Personal Finance, Money Pros, thank you! I really do think that interest rates will begin to rise and that may shut a small investor, like me, out of the property market. Higher interest rates will mean slightly weaker housing prices and deals for people who can afford it. I nearly bought my first rental property with a partner this year but my extreme unhandiness and the cost of having a property management firm handle the property kept me from buying. I have an interest in real estate but not really because of rising prices. I like the potential for regular cash flow, which is a much more predictable return, rather than hoping for prices to rise at a rate higher than inflation. But I do think real estate can be a good investment when the right approach is taken. Matt Becker recently posted…What Type of Person Do You Want To Be? I’ve read recently that REITs have been bought up to such an extent that they are overpriced. I like owning physical real estate as an investment. It requires more work and is more risk, but with that comes the chance of higher return. I bought a little over a year ago and have already seen almost a 20% increase in housing prices in my area since I bought. This is not to pre-crash levels yet, but the timing of when I bought and the fact that it was my first purchase made it a great investment (so far). Hi, Pauline. I really love this post. Love the way you write your posts. The information in this article is really unique and useful for me. After reading this article, I think I have some ideas for myself. I do follow your articles recently. Thanks for sharing this post. Hope to read more interesting information from you. Have a nice day. Housing prices in a few pockets of the U.S. have gone back through the roof, but the overall market has not fully recovered. I hope it takes a long time to recover so that we don’t see the same lending issues that lead to the 2008 crash. That being said, I do have a small holding of around $10k in a REIT fund. One thing that should be mentioned about REITs is that they should be held in a tax-sheltered account since they pay a lot of interest that is taxed as regular income. The bf and I have been considering buying a rental property for a while now and I think this year might be the year we’re able to save up the down payment. I’ve wanted to invest in a rental property for years. Now that we are secure with our savings, we are looking for other ways to invest. Hopefully in the near term we can acquire a property and get some extra cash flow from it. Today, real estate market is growing very quickly and create a great opportunities to make a money by investing in it. Investing in real estate is one of the easy way to earn money in short time duration rather than other ways. Thanks for this excellent post.